I remember a camping experience we did by bike to the Oregon coast range. The team leader gave a wild story around a camp fire about seeing Big Foot. The funny thing is that I kind of believed the story. He claimed that one night he was camping in Alaska, just sleeping outside in his sleeping bag. He was then carried away by Big Foot, who dragged him to a Big Foot family cave. Turns out that he had some chewing tobacco on him, so he gave the chewing tobacco to "Daddy" Bigfoot. Well, when Daddy Bigfoot saw the tobacco he ate the whole can, instead of just chewing it in his lip. Bigfoot then passed out from eating it, and our camp leader was then able escape the Bigfoot family cave, as all the other Bigfoots were concerned about Daddy Bigfoot passing out from a serious tobacco buzz. Great story, and good laugh, and one that I definitely remember. Join in and write your own page! It's easy to do. How? Simply click here to return to Camping Stories. Diamond Lake campground in Oregon is one of my favorite places to be. We get to go there every year for my birthday. Actually, my good friend is one day older so we all get together to celebrate. This year will be the 4th year we go camping out there. I love it. It is a little bit in the middle of nowhere, there are some stores and a resort there. We didn't know there was a pizza place right next to the campground! It is excellent, we actually plan our trip to include one night at the pizza place. 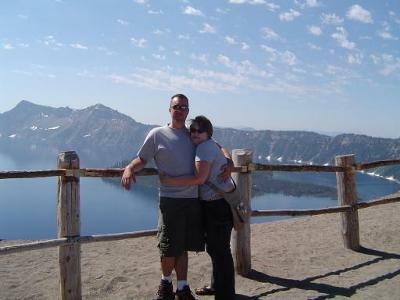 And every year we go to Diamond Lake we also go up to Crater Lake, Oregon's only National Park. Up there it is amazing! It is amazing to see such a vast lake on top, well in a mountain! The water is so clean and blue. I love this trip. I also enjoy getting to watch all the wildlife. There is some sort of ground squirrel at Diamond Lake that burrows in the ground. And some years we get campsites that are on top of their little kingdom and it is fun to sit and watch them scurry from one place to another.